2017 champion Thomas Bassinger begins his defense. Why do we play fantasy football? To increase our knowledge of the game? For the competition? Because of friendship? Fantasy football is all about bragging rights. And there’s only one way to secure them. You have to win a championship. I did last season, and my Tampa Bay Times co-workers have never stopped hearing the end of it. I’ve been insufferable, relentlessly reminding them of their shortcomings. Act like you’ve been there before? Pffffff. That’s what losers say. How’d I win it all? You have to do more than set your lineup right before kickoff on Sunday. The path to fantasy greatness begins long before then, even long before draft day. It is forged while others are sleeping. In April, that means tracking signings, trades and coaching changes. In September, that means scouring the waiver wire at 3 a.m. Excellence never rests. I know what you’re thinking: Who has that kind of time? I do. And guess what. I’m willing to share my knowledge with you, dear valued reader. All because you visited tampabay.com. And because my editor asked me to. Recently, I rounded up the few fantasy football fans in the office who were still willing to talk to me and we held our second annual draft. Ten teams. Sixteen rounds. One hundred and fifty-nine players, and Dez Bryant. Use it as a guide. In other words, do what I do and not what the others did. • In our league, we start one quarterback, two running backs, three receivers, one tight end, one team defense/special teams unit and a kicker. We have seven bench spots. • Teams could skip drafting a kicker to temporarily add an extra bench player. We did this because no one needs to draft a kicker. You can pick a random one before Week 1 and it likely won’t make a difference. • We’re using the ESPN standard scoring format: one point for every 25 passing yards, four points for every touchdown pass, one point for every 10 rushing/receiving yards, six points for every touchdown run/catch and one point per reception (PPR). Sharockman: Will Kamara’s value dip when Mark Ingram comes back? Hopewell: When Ingram comes back, he’ll be a second-tier back just like he was last year. Contorno on Barkley: I had no interest in a rookie running back. Hopewell: I mean, it’s fine. He already has a hamstring injury. Bassinger: Leonard Fournette did okay. Hopewell: When Saquon Barkley becomes 240 pounds, let me know. Hopewell on McCaffrey: It’s PPR. Who’s competing with him for touches? I like the depth at wide receiver better than I do running back, so I wasn’t going receiver and waiting 12 picks for it to come back to me. He’s basically a running back and a receiver in one. He is Carolina’s offense. What are they going to do? Throw to Torrey Smith? Is Devin Funchess finally going to get open? Varian: Where is he on the cheat sheet? Thalji: I did not want to draft LeSean McCoy. I wanted a steady starter who didn’t have issues. Hopewell: You concerned about Cooper’s drops? Bassinger: I care about touchdowns. Hopewell: He doesn’t score them. Hopewell: And they came in two weeks. Varian: I know Mark Ingram’s suspended for four games, but he had 1,000 rushing yards, 400 receiving yards and 12 touchdowns last year. I have two other running backs. I don’t in theory need him before Week 5. I checked the bye weeks. Sherman: Who’s got time to sit there and worry about matchups? Sharockman: Somebody needs a reason to watch the Miami Dolphins, and for me, it’s Kenyan Drake! Hopewell: I hate Marshawn Lynch, but that’s just me. Contorno: I kind of have a weird feeling about him having a comeback year. The offensive line is healthier, and he played well down the stretch. I think Jon Gruden will hand the ball to his best player. Bassinger: Gruden’s best player? I took Amari Cooper two rounds ago. Hopewell: He’s talking about ones who can catch. Bassinger: We know Gruden likes older players. Is it going to be Charlie Garner in the next round, Mike? Contorno: I’ve heard from our beat writers that Ronald Jones had a really impressive camp so far. Dropped two balls yesterday. Hopewell: He doesn’t have MRSA, so that’s a step in the right direction. Tisch: I like Greg Olsen. I think that’s a good pick. Bassinger: Yep, before his foot injury last season, he had gained 1,000 yards three straight seasons. Tisch: Argh! Rashaad Penny was the running back I was waiting on. That’s the perfect high-ceiling, you-just-don’t-know pick or you’re waiving him in Week 8. Bassinger: I don’t know. Behind that Seahawks offensive line, he’s pretty much by himself back there. Hopewell: Seahawks running backs scored one touchdown last season. Everybody got hurt. I rolled C.J. Prosise out for some games. Tisch: I had the other dude. Thomas Rawls. Ugh! Jamal Thalji: It didn’t take me long to choose Todd Gurley with the top pick over Le’Veon Bell or Alvin Kamara. Gurley is more versatile, more athletic and plays for a more dynamic offense. He also has less wear and tear than Bell and doesn’t have backfield competition like Kamara. I struggled taking Baltimore’s Alex Collins in Round 3, but I wanted a solid starter who wasn’t going to split carries. He was a reach here, especially because he’s not a pass-catcher, but he’s the lesser headache. Everyone mocked the pick. A few rounds later, three owners each drafted a different Green Bay running back. None of them know if they got a starter, but I did. Player I’m happy I drafted: Aaron Rodgers. I got the No. 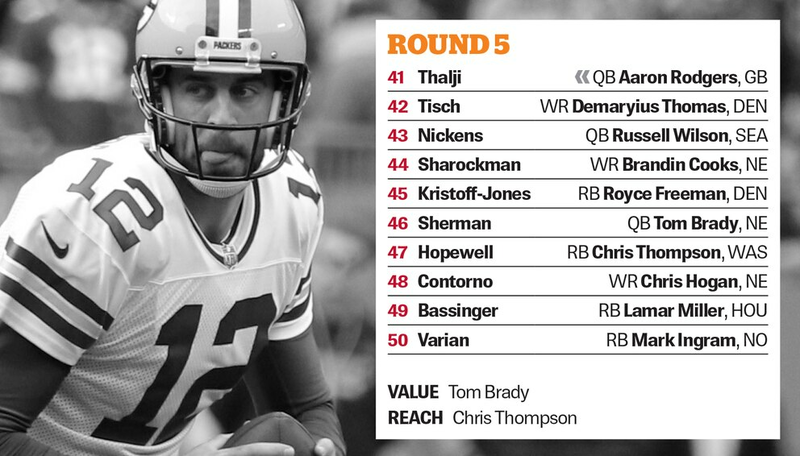 1 QB in Round 5. Player I wish I had drafted: Leonard Fournette. I’m not happy with my RBs; I was on the wrong end of the draft when he went. Chris Tisch: My draft was pretty traditional, with two running backs at the top who I think will get a lot of touches. I was delighted to get Aaron Rodgers’ No. 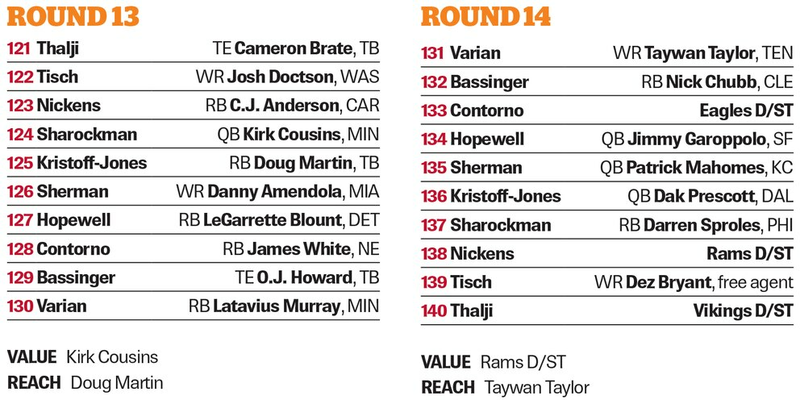 1 receiver, Davante Adams, with my third-round pick, then continued to build depth at the skill positions until filling tight end and quarterback in Rounds 9 and 10. I tried to balance some safer picks with others with upside throughout. Tim Nickens: As a fantasy football rookie, I can only say, “Wow.’’ Some of you guys are way too serious. Not only are you spouting stats I’ve never heard of, but you’re talking confidently about players I’ve never heard of. No wonder the draft took more than three hours. Player I’m happy I drafted: Greg Olsen. I got him in the seventh round as the fourth tight end taken in our draft. It appears he has recovered from last year’s foot injury, and he’s reliable. Player I wish I had drafted: Jordan Howard. I really wanted Howard as a former Hoosier, but another Hoosier (Aaron Sharockman) beat me to him. 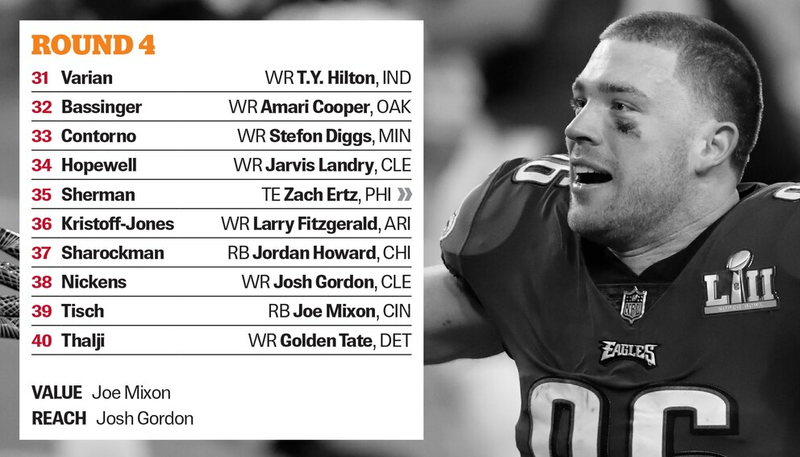 Aaron Sharockman: My first big decision was to go with Travis Kelce ahead of Rob Gronkowksi in Round 3. Kelce has been consistent and consistently on the field for four years, and I don’t know what to expect from Gronk. I lose a little upside, but my tight-end spot is set for the season. The more I look at my team, the more I think things come down to Jordan Howard. He’s in a new offense, and he’s never been strong catching balls out of the backfield. If he takes a step backward this year, I think I’ll struggle to make up those points with the rest of my running back depth. Sean Kristoff-Jones: By the time it was my pick, most of the top running backs were gone, so I took Antonio Brown. Ben Roethlisberger has something to prove after a decline in his 2017 rating. In the second round, I had to go running back, so I picked Dalvin Cook, who I believe will carry most of the load in Minnesota though he is returning from a torn ACL. In the middle of the draft, I picked up Patriots receiver Julian Edelman, not realizing he was serving a four-game suspension. Michael Crabtree and Larry Fitzgerald will be my main receivers until Edelman returns in Week 5. I started off the draft strong by taking the top receiver over okay running backs. That strategy is going to help me this year. 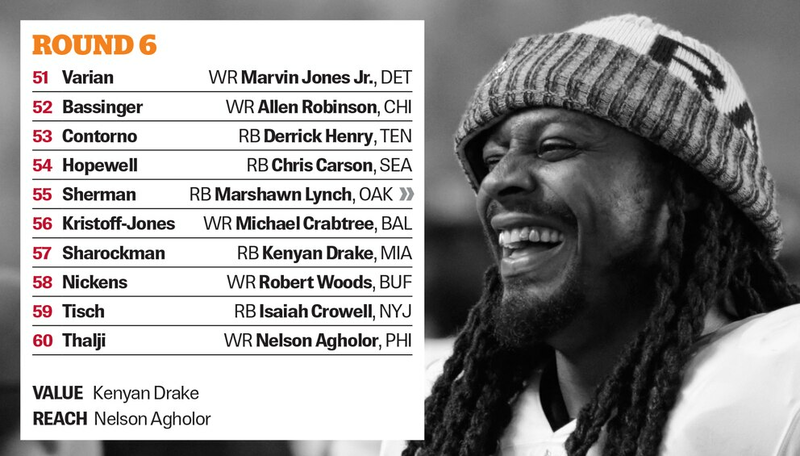 Mike Sherman: I look at my roster and think, “This is what you get for not buying a fantasy football magazine, drafting off the cheat sheet handed out five minutes before the draft and taking suggestions from your 12-year-old son.” But I should have taken more suggestions from him. Are Dirk Koetter and I the only ones who believe in Peyton Barber? We’ll show you. 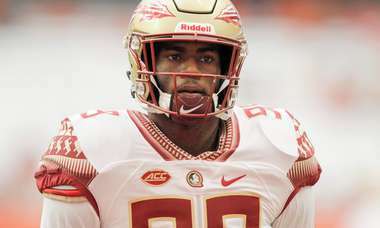 Remember those big catches Mike Williams made for Clemson against Alabama at Raymond James? I sure hope he does. 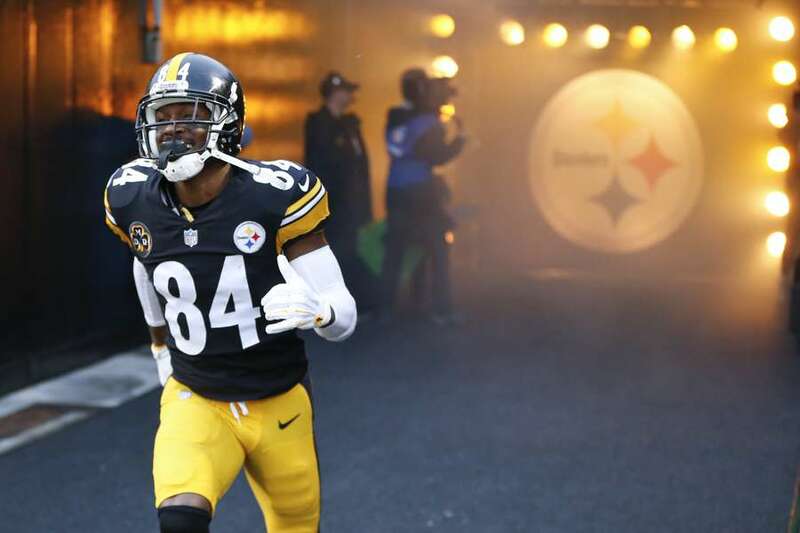 When you draft like I do, you need to hit on a bunch of late-round picks or free agents. No Derrick Henry. No Rashard Penny. There’s always the waiver wire. Kyle Hopewell: The draft went pretty much how I expected, with people focusing on running backs early and waiting on QBs. Pick I regret passing up: I should have gone QB in Round 9 instead of with Kenny Stills. I was so committed to waiting on a quarterback that I drafted a Dolphin. I also should have taken Alshon Jeffery in Round 8 instead of Evan Engram. Yes, he’s hurt and will get hurt again, but the upside was too great. 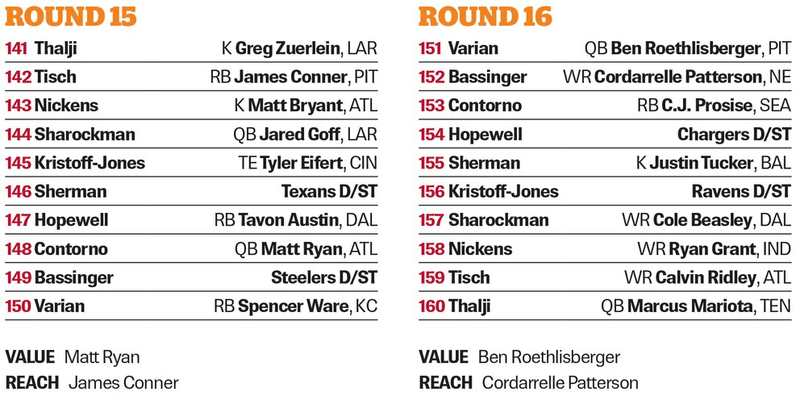 I’m intrigued by Contorno not drafting a running back until Round 6. He said that he was going against the grain. That’s cool and all, but the guy who chose Betamax instead of VHS isn’t patting himself on the back right now. Steve Contorno: Slotted to draft eighth, there was no chance any of the top four backs would fall to me. Instead of trying to play catchup at running back with lesser talent, I tried to give myself a big advantage at wide receiver. Julio Jones, Keenan Allen, Stefon Diggs and Chris Hogan could combine for 400 catches. I nearly took Gronk at the start of the second round and sprinted to grab him when he fell to me at the end of the third . After that, I just bought as many lottery tickets at running back as possible, focusing on undervalued starters (i.e. Rob Kelley) and guys who will catch a lot of balls (i.e. Duke Johnson). Player I’m happy I drafted: Derrick Henry. If he takes over the Tennessee backfield, you can put me back in the title game. Player I wish I had drafted: When Kirk Cousins went off the board, I started to have second thoughts about waiting to get a QB. 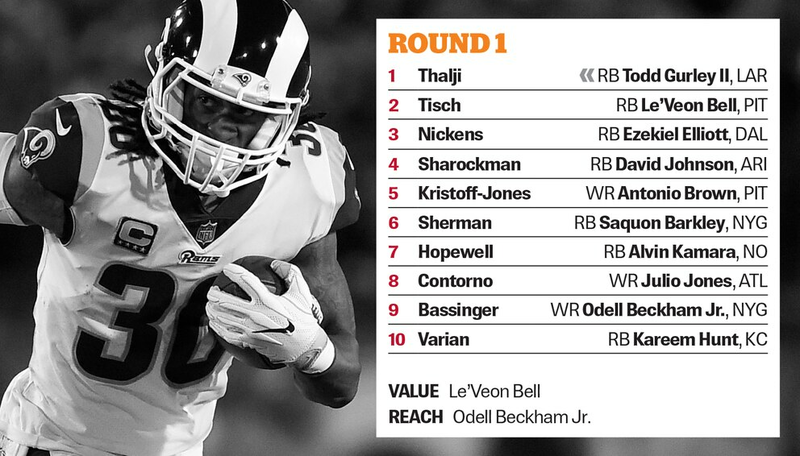 Thomas Bassinger: Stuck at the back end of the first round, I was choosing between Keenan Allen, Odell Beckham Jr. and DeAndre Hopkins. Beckham’s ability to create separation from defenders makes him a more dangerous receiver. 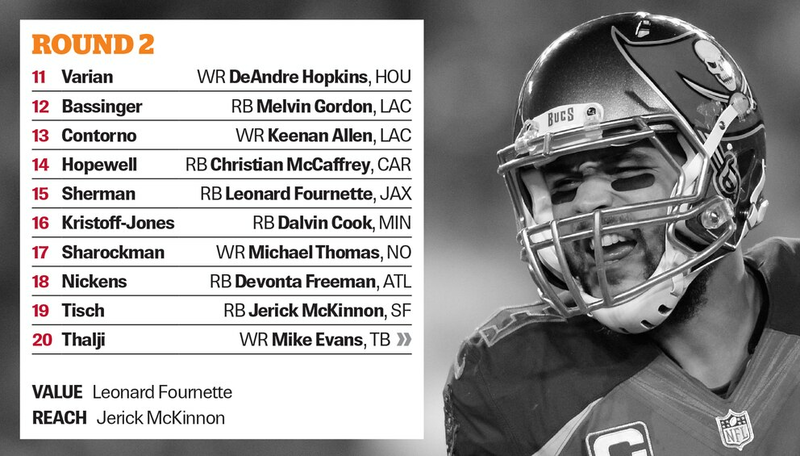 With my second pick, I wanted to take another receiver, Keenan Allen, but went with Chargers RB Melvin Gordon. I like to maintain flexibility during the draft and didn’t want to be in a position where late in the third round I felt compelled to take a running back even if I didn’t like the options. After seeing how it unfolded, that was the right call. Player I’m happy I drafted: Deshaun Watson. I’m expecting some regression, but I like the value he adds as a runner and am high on Houston as a team. Player I wish I had drafted: Derrick Henry. 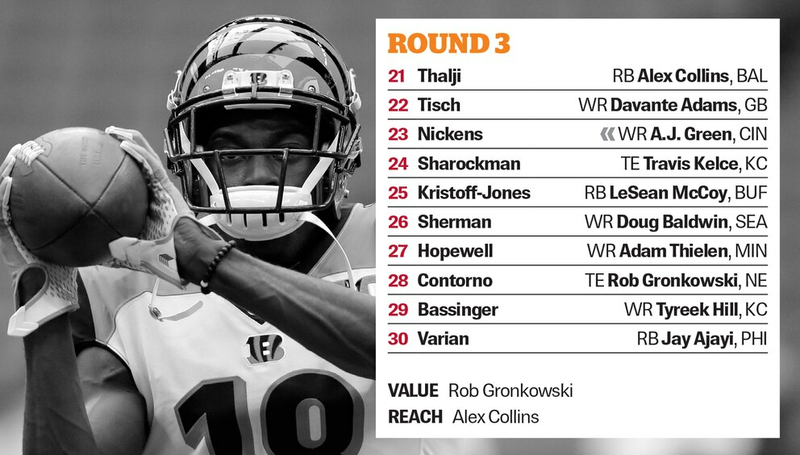 Bill Varian: The advantage of the 10th spot in the draft is the opportunity to land two solid, bankable players, and I did that with Kareem Hunt and DeAndre Hopkins, though the QB situation in Kansas City gives me some anxiety. 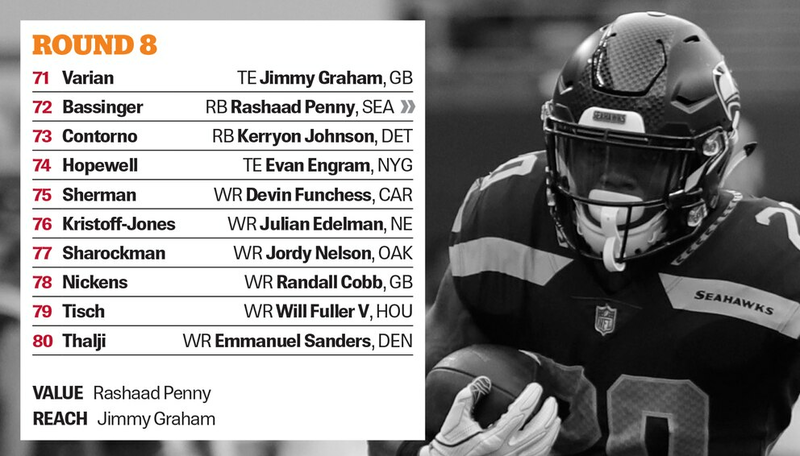 I don’t love Jay Ajayi in Round 3, if for no other reason than his weak PPR value, and also because he seems like a head case who could implode at any time. I think T.Y. Hilton is a solid gamble in Round 4, and Mark Ingram, coming off a suspension, could prove a steal in the fifth, the sort of risks I like to take. 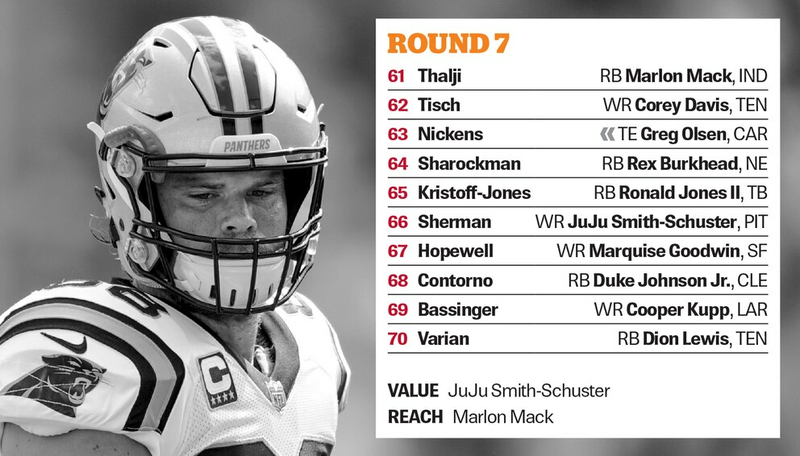 I do regret Marvin Jones in the sixth round because his upside is pretty established and it won’t be great, plus there are players that went after him who offer greater upside. In my first year in a PPR league, I wasn’t sure when the run on quarterbacks would begin. I jumped too early on Philip Rivers, who will be solid but not great.